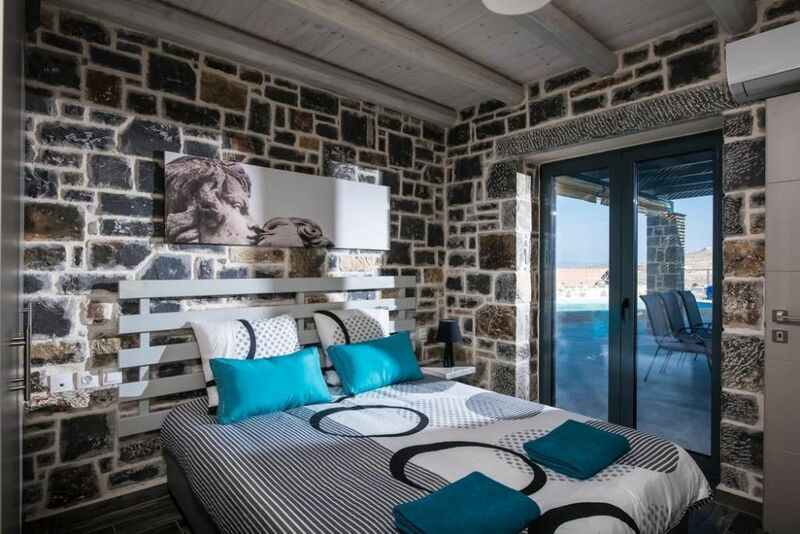 Stylish holiday villa for rent in Crete. 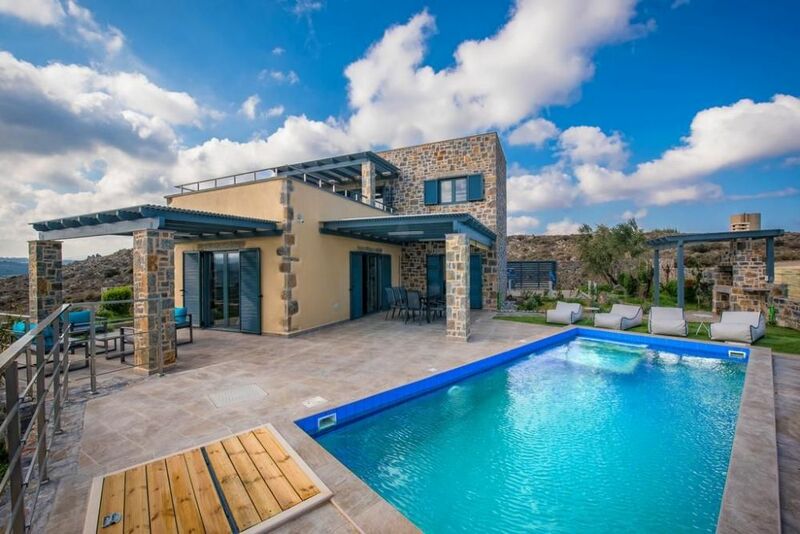 Located about 20 minutes’ drive to the south-east from Heraklion, this villa is in just few minutes from the popular Waterpark and about 4 km from the beach. 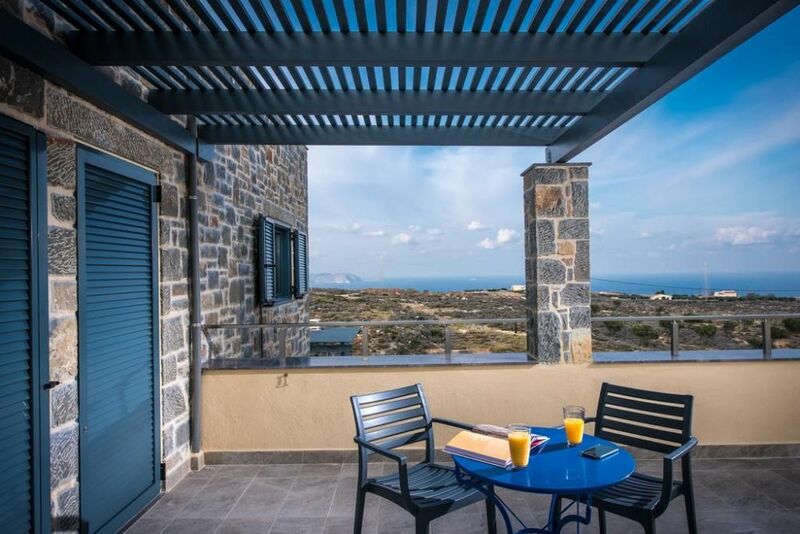 Resort on the coast offers a wide choice of different shops, taverns, big supermarket and other amenities (pharmacy, tour agencies, gas station, etc). Car is necessary when staying for quick access to the sea, shopping, dining. 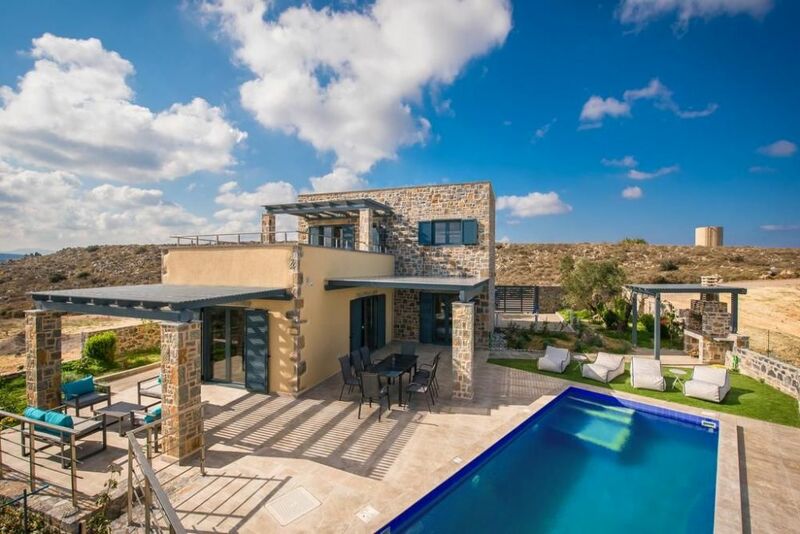 Moreover, villa’s location is a good point to start exploring the island – world famous Knossos Palace, museums are about 9 km away. 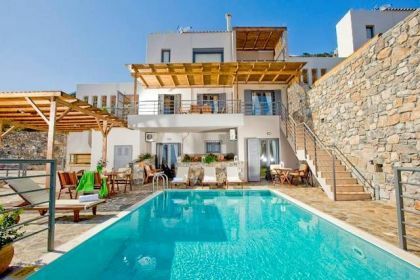 Also, it is very easy to take daytrips to Agios Nikolaos or Rethymno town. 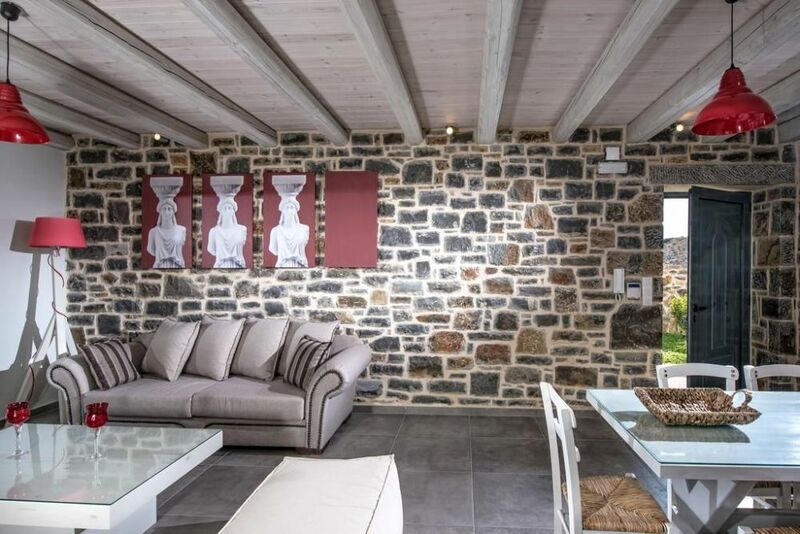 This two-storey villa features exceptional style, made of natural stone with wood-beamed ceilings and broad windows. 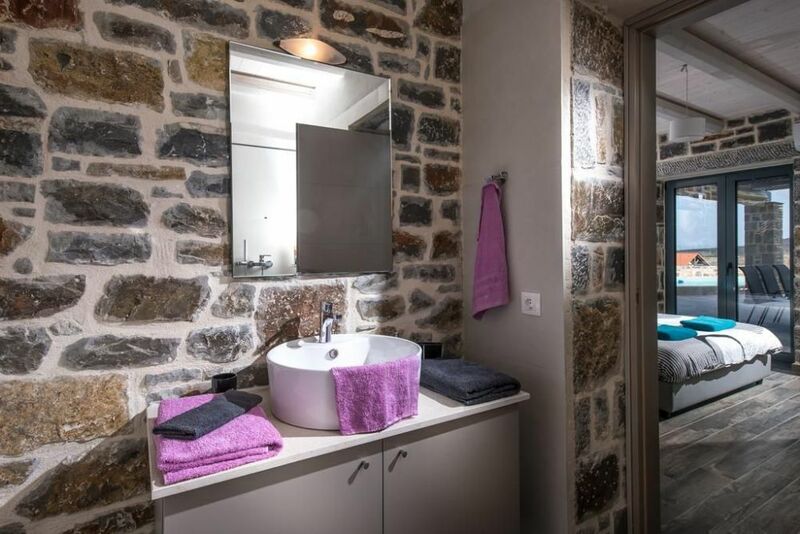 It accommodates up to 8 guests. At guests’ service, there is a spacious open plan living area, united with dining zone and kitchen. 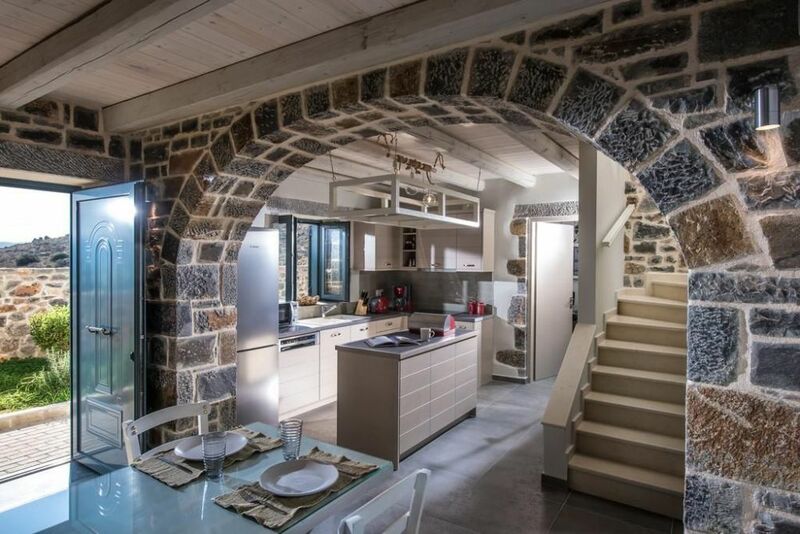 Kitchen with a small island is modernly equipped and is very convenient for self-cooking, includes electric hob/oven, microwave, fridge-freezer, dishwasher, full set of crockery and utensils. For entertainment, there is a big flat screen TV with satellite channels, audio/ video system, movie collection and Nintendo game console. Wireless internet provided throughout the villa. 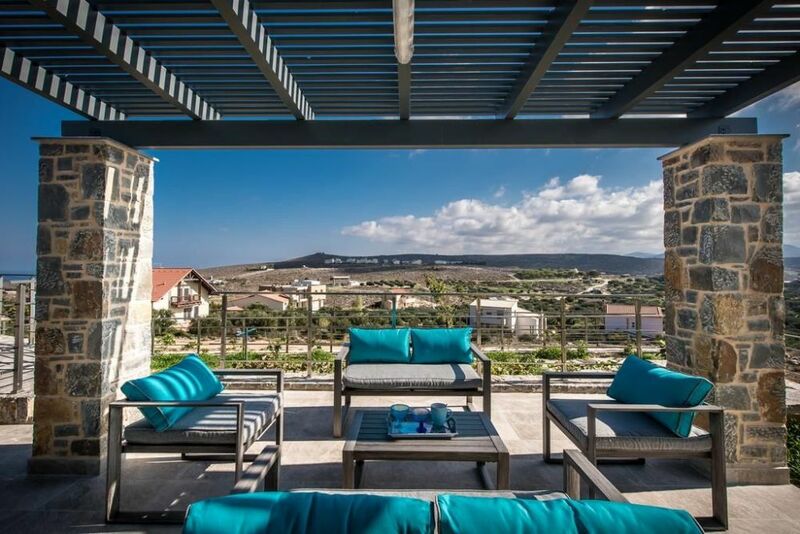 Lounge area opens to a covered terrace, furnished with two dining sets for guests to enjoy open-air meals. 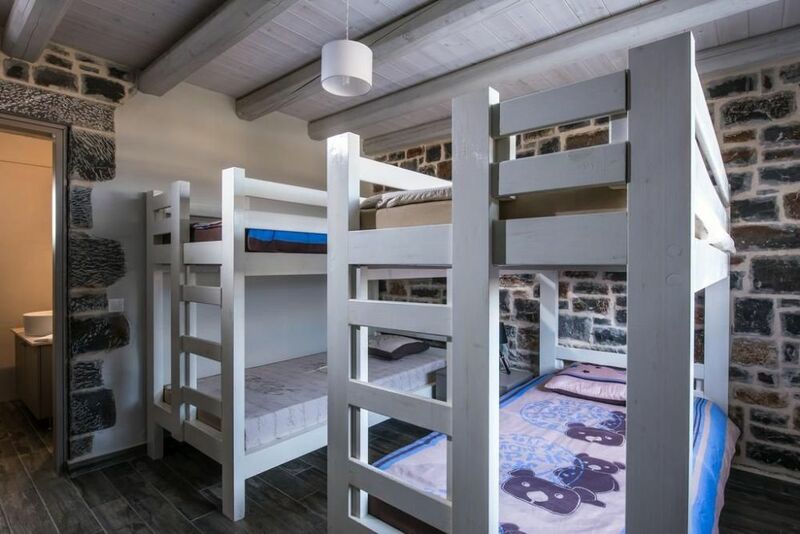 Villa has 3 bedrooms, two of which have a double bed, the third room comes with 2 sets of bunk beds and sleeps 4 persons. 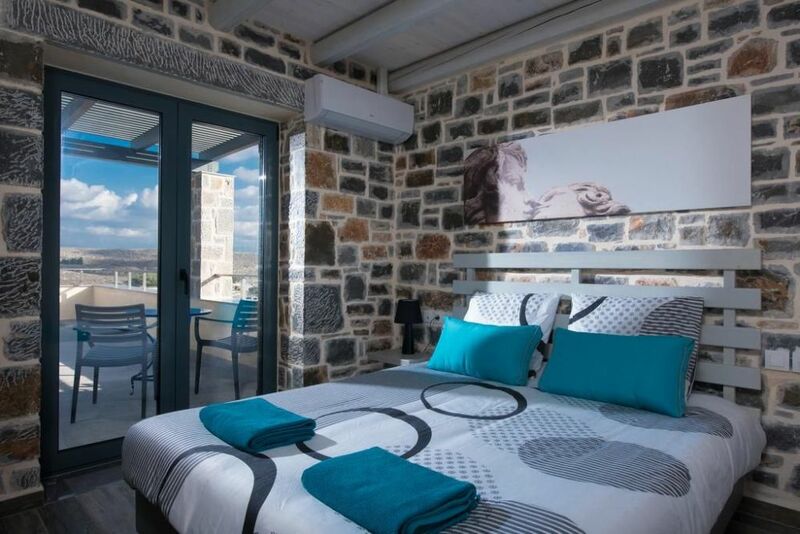 Two of the bedrooms have ensuite bathrooms, towels provided and changed weekly, together with cleaning. 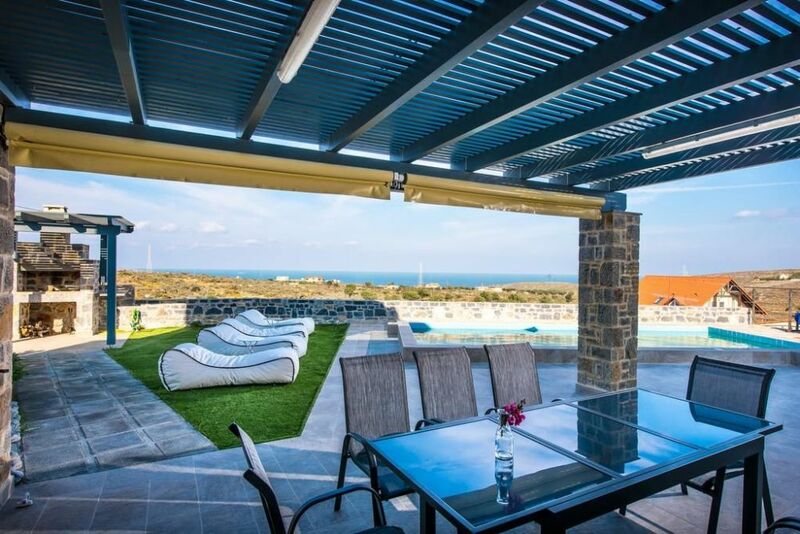 Outdoors, there is a private swimming pools, surrounded by a paved deck with sunbeds for sunbathing and relaxation, followed by great views over the sea and surroundings. 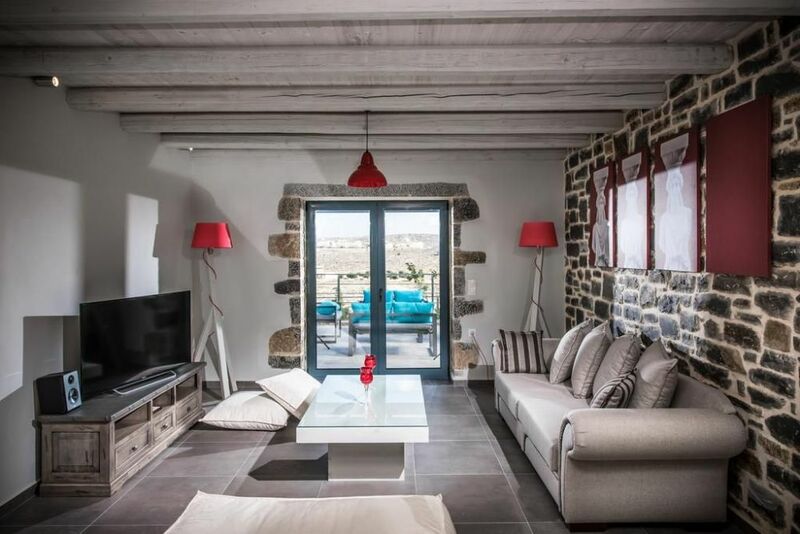 Also, guests are welcome to use barbeque oven, where they can prepare delicious grill-dinner. 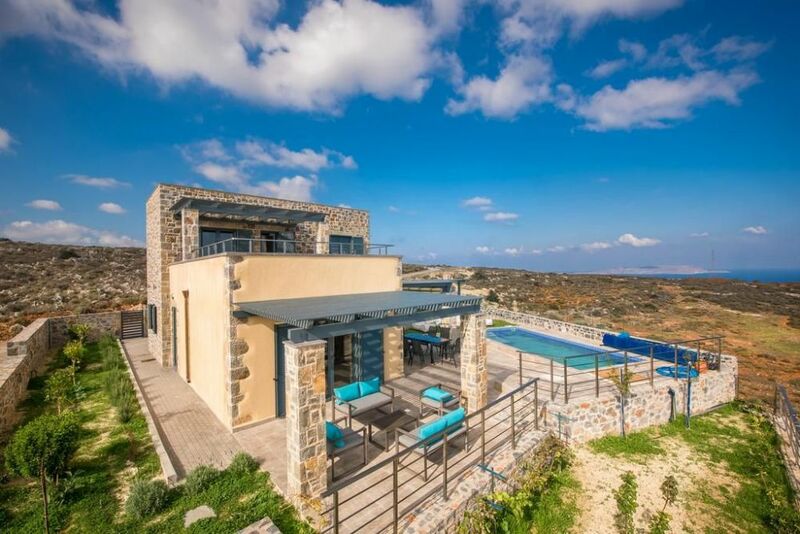 Do not hesitate to contact us for more information about this villa and come to Crete for exciting summer holidays!